So you want to get to know some Christian missionaries in Okinawa Japan? You've come to the right place! Meet the Woolery family! Brian and Julie Woolery and their family have been serving in Okinawa, Japan since 2010. But they've also been in the Philippines, and in Guam, and their work continues to send them to other areas in the region. Okinawa is Prefecture of Japan, consisting of 161 islands, about 1/4 of which are inhabited. It's southwest of mainland Japan, between Japan and Taiwan. It's a humid, subtropical climate. 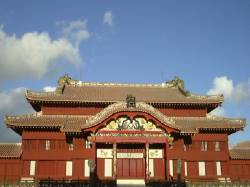 Okinawa was once a kingdom of its own - the Kingdom of the Ryukyus. As such, it has maintained a unique cultural heritage. In certain periods of its history, castles like the one above became a familiar sight on the islands, and many remain today. There may be other Christian missionaries in Okinawa Japan, but we have had the special privilege of knowing the Woolerys through their blog. Because they've been blogging since 2007, you can also learn about their previous ministries and moves. Pictures, glimpses of family life, and stories of ministry are all a part of their site. Their congregation is not only multi-cultural (Japanese, Filipino, and American), but they also face the challenge of lots of comings and goings! With so much moving of military personnel, how do you train leaders and maintain a culture of growth? Read the latest post from these Christian missionaries in Okinawa Japan by clicking below.